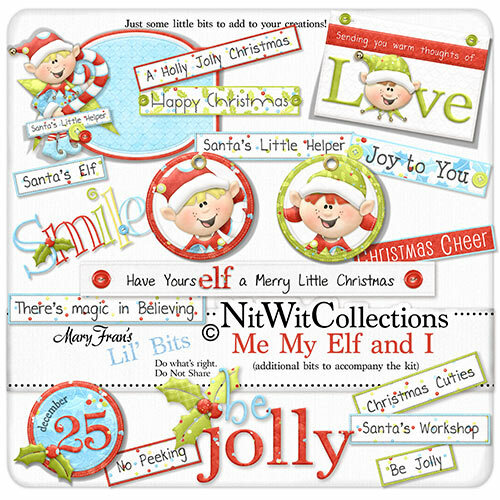 Here are some "Lil' Bits" that are great little additional elements to go with my "Me My Elf and I" Fat Quarter Bundle kit. Yup, just some lil' embellishments to add to your layouts and cards! 1 Journal Tag - embellished to the nines! 1 Word Art - "Be Jolly"
1 Word Art - "Have yours"elf" a Merry Little Christmas"
1 Word Art - "Sending you warm thoughts of Love"
1 Word Art - "Smile"